The Cave, as I call it, has a lot of info, pictures, & videos. One feature is the slide show roomwhere you will find all sorts of slide shows that are set up for those on a slowwwwwww connection. The pics open one at a time, instead of all at once. The video room has a bunch of vids that I have done, some relate to the club some do not. It is a webmasters perk I guess!!!!!! Here is the link to get to The Ancient Ones Message Board. It is like the worlds slowest chat room, but there you will find current info. on club events. Also it is a great way to keep in touch, and disscuss any thing ya want to, and believe me we do! Please check it out, if you have any problems regestering to post, shoot me an e-mail and I will get you on in no time. Last Years Show was GREAT!!!! At our rendezvous, you will step back in time to the pre 1840 era. We do our best to be period correct. With that said, we DO make allowances for newcomers, prescription glasses, and a few other things. All we ask is that you try to improve each year. So if you are tired of all the politics and strict thread counters, then WE ARE the club for you! If you have a passion for the outdoors and a love of history, come check out one of our Rendezvous. We do NOT allow four legged friends, of any kind at our events. The Ancient Ones host two Rendevous a year. In the spring - weekend after Mother's Day in May, and in the fall - Columbus Day Weekend in October. 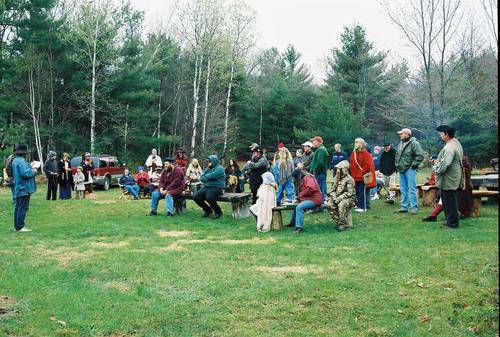 All pre 1840 reenactors are welcome to come camp with us. The Public is welcome to stop by on Saturday and visit for free. You can walk through the camp and step back in time. Come in on the Livermore side - At the south end of the Crash road (near the intersection with Route 4), take Hathaway hill rd and just keep going straight. This becomes a dirt road, then you will come to the gate...you are now on Meadowview Rd in Canton. Google maps can give you a pretty good idea of how to get there (http://goo.gl/maps/Bwy4R). Once you go down far enough on Meadowview Rd, you will see a field with flagpoles and lots of tents. Can't miss it! Google says that Hathaway Hill Road and Meadowview Road are not connected, but they are.